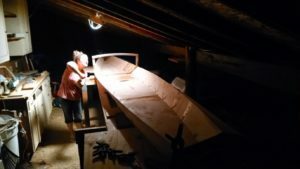 I’d been dreaming about building a canoe for years when we finally moved into a house with a long outdoor covered shed area. My wife bought me the wood for my birthday and told me to stop staring at picture of boats and go make one. I’m glad she did, it was a big project and it would have taken a few more years before I started it on my own. The boat itself is designed from a set of free plans you can get from Jem Watercraft. Its a touring canoe, which means its BIG. At the time, I thought I’d love to get out on the lake with my then budding family and so I’d need a bigger boat. What I didn’t realize at the time is that there’s a lot of time between babies are born and they are any fun to have in a boat with you. Also, its not really that fun having 6 people in a canoe. Its very stressful, actually. So, since it was much bigger than I wanted to handle as a solo paddler (mom was stuck on shore with the babies), I turned it into a sailboat. I haven’t decided yet if I’m not a good sailor or if its not a good sailboat (its probably mainly me), but it does go with the wind and gets pretty fast. Its going upwind where I can’t seem to figure it out. 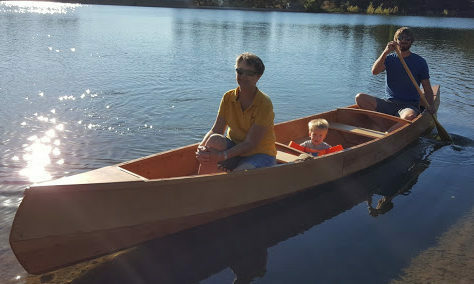 The boat is made from birch plywood off the shelf at Home Depot. I used the stitch-and-glue method to piece it all together and wrapped it inside and out with fiberglass and epoxy. The trim along the sides and across the thwarts are oak. Its a heavy boat. But its solid. The sailing rig is made from pine and whatever other scraps I could find around the shop. 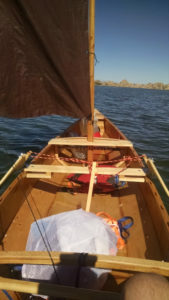 The sail is a tarp, trimmed to the proper shape and edged with p-cord and duck tape. Since I was making it up as I went I didn’t really want to spend money on it if it wasn’t going to work. It ended up sailing though, so maybe someday I’ll upgrade to nicer materials. Probably not though, I’m more interested in the practical side of things when it comes to my boat. Lately the weather here has been so dry that the lakes have been low and my keel boards get caught up in the weeds. So sailing doesn’t really work. So I’ve been looking into setting up some rowing attachments so I can still use it this summer. I’ll blog more about that later. To me the boat is definitely amateur work and while very functional, there’s a lot of improvements to be made in the eye-candy category. 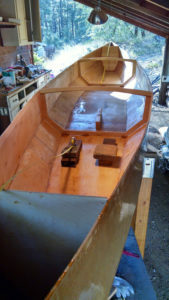 But one of my favorite tag-lines I’ve seen in the boat-making forums is “Its really hard to make an ugly boat”. Its true.